From majestic glaciers and icebergs floating in deep-blue water to the island’s unique indigenous wildlife, the natural wonders of Greenland are the stars of this soft adventure voyage. Whales and seals often accompany the OCEAN DIAMOND, while musk ox graze ashore. Welcome to Greenland! The OCEAN DIAMOND anchors off Kanglerlussuaq and embarkation is conducted via our Zodiac boats. The ship departs in the evening. Enjoy the scenery as the ship cruises through the fantastic Evighedsfjord. Learn more about the country and its people at interesting presentations provided by our knowledgeable and experienced Expedition Team. In the morning we visit the beautiful Eqip Glacier. Our next stop is Ilulissat, which means “iceberg” in Greenlandic. And with good reason, as the town is located at the mouth of the iceberg-filled Ilulissat Ice Fjord. Delight in the thunderous spectacle when icebergs break off from Sermeq Kujalleq glacier and plunge into the fjord. Enjoy the morning in Ilulissat and discover the town on one of our optional shore excursions. Ilulissat was originally founded by the Danes as a trading post in 1741. The tour takes you to the harbor and the 18th-century Zion Church, which was once the largest man-made object in Greenland. Nuuk is the capital of Greenland and its oldest town. Founded in 1728 by Danish-Norwegian missionary Hans Egede, the city combines Arctic traditions and European urbanity. With around 16,000 inhabitants, Nuuk is considered a modern, bustling metropolis compared to the rest of Greenland. Visit the city sights on a walking tour that ends at the National Museum, which exhibits the famous mummies of Qilakitsoq. In the evening we reach the small settlement of Qassiarsuk to anchor for the night. Qassiarsuk was founded by notorious Viking Erik the Red who named this area “green land” because of the inviting green valleys around Qassiarsuk. During our stop here you can learn about the lives of the island’s early Norse settlers and visit a reconstructed Viking longhouse and small turf church. When conditions are favorable, we travel along the 70-mile (112-km) Prins Christian Sound. In this narrow, often ice-choked channel, we come so close to icebergs you can almost reach out and touch them. Today we sail across the Denmark Strait towards Iceland. This route was used by Norse settlers traveling to Greenland around 900 years ago. Located off Iceland’s south coast, the Westman Islands were formed by submarine volcanic eruptions around 10,000 years ago. Surtsey Island emerged from the sea in 1963 and is one the youngest land masses on earth. We go ashore on Heimaey, the only inhabited island, where half-buried houses remain from a violent 1973 eruption. During the shore landing there is time for bird watching and you might even spot whales. After breakfast we bid farewell to the OCEAN DIAMOND as we sail back into Reykjavik. All routes and excursions are provisional and subject to change – weather, sea and ice conditions may affect the itinerary. The 224 passenger vessel was completely refurbished in Norway in 2012 and is perfect for our exploration being large enough to provide stability, speed, spacious cabins and ample public space, yet small enough to manoeuvre in remote areas. The vessel is outfitted with the most current navigational and communications technology as well as with retractable stabilisers for smooth sailing. The vessel is ice strengthened and features 18 Zodiacs for our forays ashore. 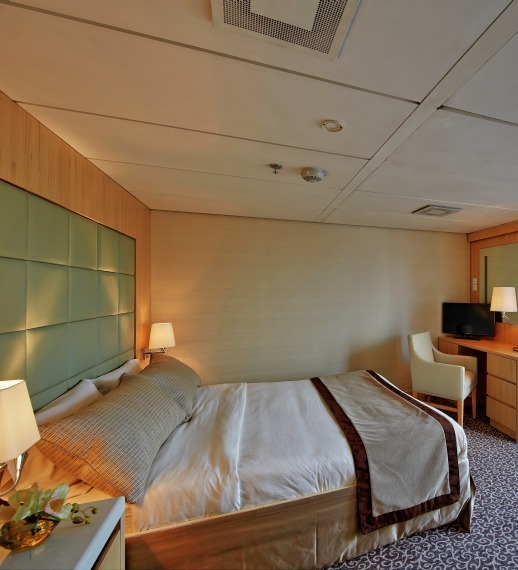 With a maximum of 224 passengers, the Ocean Diamond offers cabins across its five decks. There a range of cabins and suites available and all feature outside views (porthole, window or balcony), full private en-suite bathrooms featuring bathtub and shower, a writing desk, individual temperature control, in-room safe, refrigerator, satellite phone access, hairdryer and flat-screen television and DVD player. Cabins range in size from 17 square metres to 30 square metres. The Ocean Diamond features spacious public areas and ample deck space from where you can admire the beautiful passing landscapes. Public areas and facilities include an observation lounge with bar, a fitness centre, pool with bar, sun deck, lecture threatre with state of the art audio visual equipment, library and lounge. The restaurant serves all passengers in one, open seating and cuisine onboard is international. There is also a gift shop, clinic and a spa onboard. The single sitting restaurant is located on the Lower Deck and is both spacious and light. Breakfast and lunch are served buffet style and dinner is served to your table. All meals include a vegetarian option. Afternoon tea also served daily around the afternoon excursions and coffee, tea and water are available complimentary around the clock. Weather permitting, there will be the opportunity to dine outside on occasion. The atmosphere onboard is focused on exploration and discovery with all the creature comforts you would expect from a vessel of this calibre. The onboard crew offer excellent service and in addition the expedition team will enrich your experience with their knowledge of the region. Through a lecture programme and shore expeditions, they will share their expertise and passion with you. After a day of exploration ashore, you will return to the comfort of a sophisticated ship with a friendly crew and informal atmosphere. A fleet of Zodiacs are used for landings and nature cruises, and during your voyage you will have the opportunity to visit the Captain and Officers on the Bridge to learn more about your journey, further fostering the expeditionary nature of our voyage. Some Deck Plans may vary from what you see below. PLEASE NOTE: Below deckplan is ONLY for 2019 cruises. Please contact us for updated deckplan for 2020 trips. Optional tours and excursions are available, please contact us for more details.